It’s starting to get colder and coats are now a daily requirement upon leaving the house. Soon we’ll need scarves and hats too, and it won’t be long before we’ll be arming ourselves with a torch for evening walks now that the clocks have gone back. We experience our fair share of rain here in the UK and on cold, dark and rainy days it’s hard to find the desire to leave a warm, dry house. Your dog can feel the same way and trying to encourage them to go outside for walks or to go to the toilet in the rain can sometimes be a real challenge, especially if they like their home comforts too much. for walks in the rain for a few weeks so that your dog becomes used to it. Don’t show your dog that you hate the rain too. Try not to react to rain in a negative or overt way e.g. running indoors because of rain, as this can suggest to your dog that rain is something to be feared. 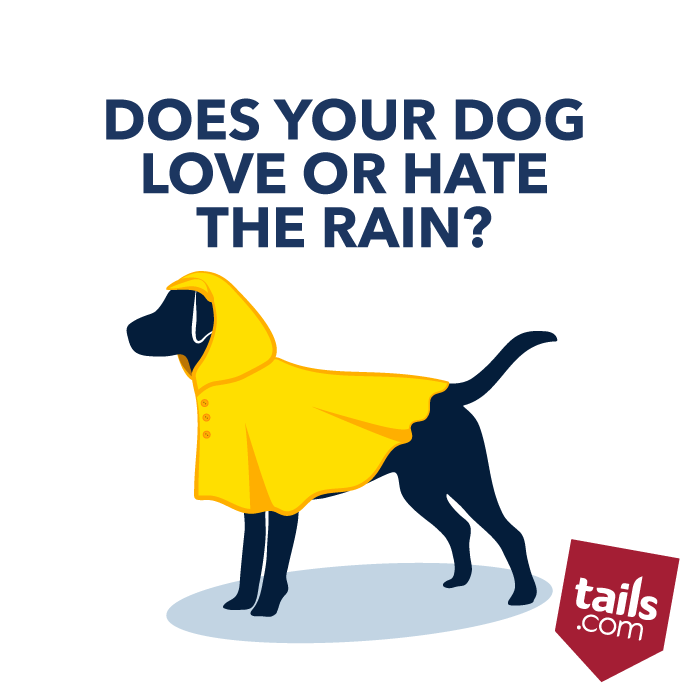 Get your dog a raincoat to prevent them from noticing the rain falling on their skin and coat too much. Play with and feed your dog on wet grass to help to get your dog used to the feeling of it. Get your raincoat and wellies on and join your dog out in the rain to show that there’s nothing to fear. Make rainy toilet breaks more appealing by giving treats and rewards. Find a regular sheltered toilet spot under a tree or behind a hedge to keep you both a little dryer. Don’t be tempted to use an indoor toileting area or puppy pads inside as an alternative to going outside in bad weather. You won’t want to undo all the housetraining that you worked so hard to achieve during the puppy stage. Lots of reward and praise is the key to making rainy outings more appealing. 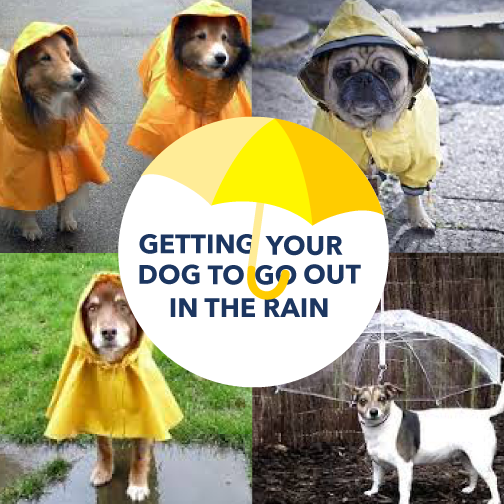 Get those wellies and raincoats on and confront the rain with your dog.